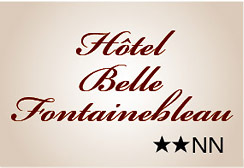 Hotel Belle Fontainebleau welcomes you in a warm and friendly atmosphere to offer you a pleasant stay in the center of the town of Fontainebleau. Discover a high quality service. We await your arrival. Centrally located in the town of Fontainebleau (77) and classified as a historical monument, Hotel Belle Fontainebleau is a starting point to discover the different sites of our city. We offer to travelers comfortable rooms for a moment of relax before passing to the adventure in the city. A warm and friendly welcome in the old buildings of the Chancellery, which are converted into hotel, 23 rooms with bathroom, telephone, satellite TV, Canal +. Please, note, the desk will be closed between 4 and 6 A.M from Wenesday to Saturday. Free WIFI, Laundry, Dry Cleaning, Breakfast in Room, Ironing, Fax/Photocopy. Reception opens 24/24, Newspapers, Room Non-smoking, Express Check-In/Check-Out.